An explanation of iceboat classes. On buying a used iceboat. 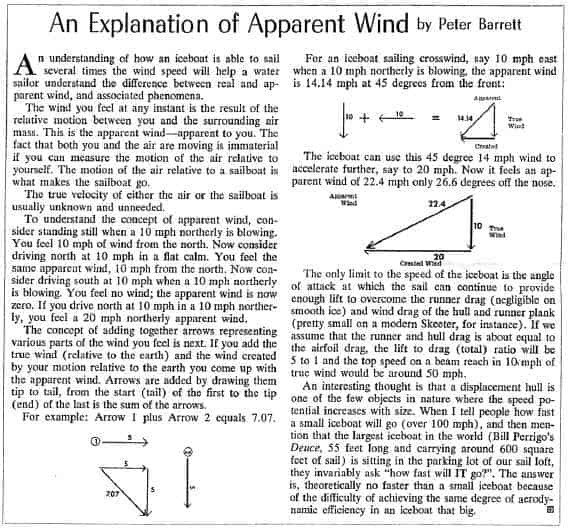 An explanation of apparent wind. An ice boat is a hull attached to a perpendicular cross piece called a runner plank. Three skates, or runners, are attached to the boat, one on each end of the plank and at the fore end of the hull. 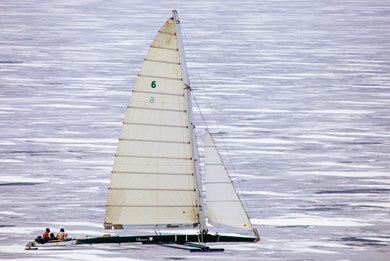 Ice boats are strictly wind powered and need relatively snow-free ice to sail. We recommend that the novice purchase an inexpensive DN class ice boat (watch the Buy and Sell Page of this website) a relatively easy boat to transport and sail. 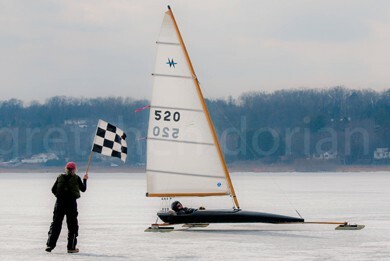 Race with the club for a season or two until you feel comfortable with ice boating. We maintain that club racing is much safer than solo cruising. After a year or two sailing DNs, evaluate your options. You may want to stay in the DNs, or move to another fleet. By this time, club members can help you make a decision whether to build or buy your next boat. See “An Explanation of the Classes” below for more information about the Four Lakes Ice Yacht Club’s various fleets. Eastern American, Canadian, and European ice boat clubs tend to have a few different classes than what we sail here in Madison, Wisconsin. Explore what your area has to offer by seeking out a local ice yacht club. Email info@iceboat.org to find iceboaters in your area who will help you to try the sport. The DN fleet is certainly the most numerous boat in the world. Being small, light, and relatively inexpensive, the one-design DN has great appeal. Carrying 60 square feet of sail, it offers spirited performance and a lot of very competitive sailing. 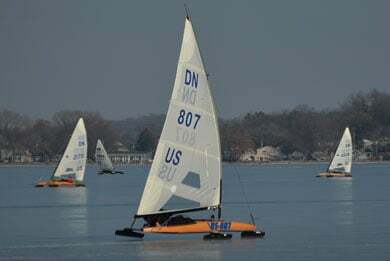 Though not as fast as the bigger boats, many ice yachters, from veterans to juniors, find the DN’s demands in competition a satisfying challenge. In addition, the DN is the only current design which offers truly international racing, with active fleets throughout Europe and Russia. Learn more about this exciting class by visiting the International DN Ice Yachting Association website. Since 1976 this one-design boat has enjoyed increasing popularity. The Nite combines a two seat side-by-side fiberglass hull with a 67 square foot rig to make a versatile day sailor/racer. Compact size, light weight, and a very active class organization increases its appeal. Nites have a well-attended annual regatta and have made excellent showings in the ISA regattas. Learn more about the Nite ice boat and organization by visiting the Nite National Organization website. The Renegade is an excellent boat for those seeking spirited on-design racing. It has been a winner and trend-setter ever since its unveiling in 1947, providing many of the design features found in today’s Skeeters. 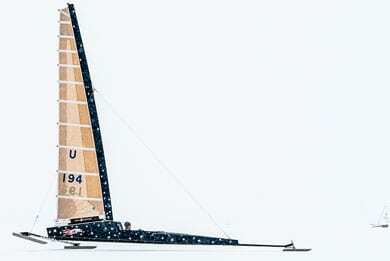 The Renegade bears 67 square feet of sail on a bendy wing spar, making it a powerful racing yacht in a small package. It is compact and light enough to be car-topped. The local Renegade fleet has seen tremendous growth as many skippers move to perhaps the fastest of the one-designs. For more information on the Renegade class, contact the Renegade Association. Detailed plans are available on the International Renegade Association website or from the IRIYA (for a mere twenty bucks). The Skeeter is the “Formula One” of ice yachting, a wide open development class where state-of-the-art sailing is seen annually. Skeeters are without a doubt the fastest land sailing vehicles on the planet. The only restriction on the Skeeter builder is a 75 square foot sail maximum sail area. While the basic configuration for successful E Skeeters has long been established, significant design improvements have been developed within the Four Lakes fleet. 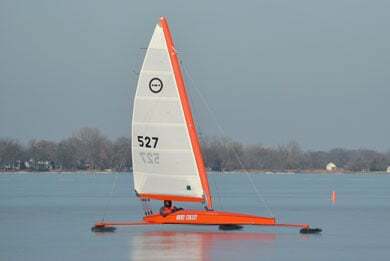 Taller rigs and rear seat Skeeters designed and built by 4LIYC members Bill Mattison and Paul Krueger have brought world championship titles to Madison skippers. In 1989, New Jersey’s Dan Clapp took the ice boating world by storm with his first front-seater and dominated the ISA regatta during the 1990s. Skeeter builders are adept with high tech materials like carbon fiber, and Kevlar. The super powerful Skeeters are the fastest boats on the ice. Sufficiently committed skippers find the greatest challenge in these boats, where design, building, and maintenance skills share equal roles with sailing ability. Learn more on the ISA page. The big boats are where it all began. Other than the fact that these yachts fly a jib and steer from the stern, they bear only a resemblance to past giants of the ice. Modern hardware and improvements in aerodynamic rigs have allowed today’s stern-steerer to easily outclass its ancestors. The fleet is divided into three classes: A sail area over 600 square foot; B 450 to 600 square foot sail area; and C 300 to 450 square foot of sail area. Tradition-oriented skippers and crews maintain an active class organization, the Wisconsin Stern Steerers Association, and organize a spectacular regatta and cup races annually. Read more about the WSSA and the efforts of those who are restoring these historical ice yachts. The Ice Optimist was created specifically as a youth trainer. It was designed to be easy to build using commonly available materials, to keep costs to a minimum. It uses a standard Optimist dinghy sail plan (hence the name), so youth sailors can use much of the same equipment in summer and winter, if they sail/race in both seasons. It’s is a smaller, less powerful boat than a DN, and is generally sailed in a bit more comfortable upright position. An Ice Optimist provides performance and stability that are a better match for the experience level and self confidence of most “green fleeters.” Ice Optimists can be sailed on smaller sheets of ice than other ice boats. Small lakes and even larger ponds can be quite suitable. They should always be sailed under tight supervision by adults. Learn more about Ice Optimists on the 4LIYC Ice Optimist website. The folks at Waterlust produced this video in 2015 on Lake Baikal in Siberia. It’s the definitive guide as to how an iceboat racing course is set up, how they start, race, and finish. A boat that’s been actively sailed recently is more likely to have all the parts and be “ready to go”. The longer it’s been in storage the more chance there is for various mode of degradation to kick in (everything from dry-rot, rust on runners, and simply misplacing parts). It’s hard and impossible to make any serious evaluation from a couple of photos but they are useful for pre-screening. If I were looking for an older cruising ice boat I would definitely go and check it out in person to make sure looks well kept, and all the parts appear to be there. In other words, none of the obvious “red flags” that would indicate it’s not even worth looking at. What to look for is tough. Generally pretty obvious stuff: check the rigging and fittings to make sure there aren’t any broken strands in the wires and the fittings on the hull, mast, boom, and plank look good. Check the steering for gross amounts of play. Look for obvious signs of wear on the sail and damage to the hull (cracks in the sideboards, etc.). Look at the edges on the runners for sharpness and lack of rust or nicks. Stuff like that. Again, if the boat has been actively sailed recently, then that ups the confidence considerably. 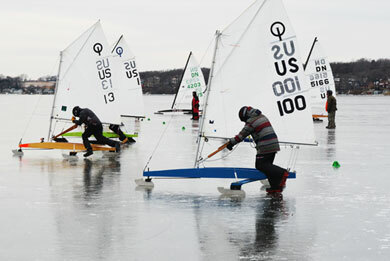 Ice boats while under sail do not have brakes. In order to stop an ice boat, a skipper steers it directly in to the wind. While sailing, it is often possible to slow a boat down by easing the sheet rope (the rope that controls the sail shape). Ice boats do have a parking brake attached to the front runner and it is employed after the boat is completely stopped. The parking brake allows the skipper to walk away from his boat when not sailing. Ice boats can range in cost from a few hundred dollars for an old un-classified ice contraption or perhaps an old uncompetitive DN class boat, to $60,000 for a modern, championship winning class A Skeeter. Between the $200 beater and the $60,000 championship contender are many fast competitive boats in various classes that can be had from around $2500 to $7500. You will find the most comprehensive list of boats and part for sale on the Buy & Sell page of this website. Many ice boaters feel the thrill of ice boating makes even one single ride per year well worth the effort. On Madison lakes, a person can sail probably four to six weekends per year. More in a “good” year, and of course, less in a “bad” year. When conditions are good, taking a day or two off from work during the week can increase your amount of fun sailing time. A willingness to travel a bit to find good ice will increase your sailing times to perhaps as many as ten to twelve weekends per season. Apparent Wind: Giving iceboats, land yachts, and America’s Cup yachts the speed edge. Artemis Racing Team Manager and tactician Iain Percy explains the concept of apparent wind, and how it allows America’s Cup Class yachts to travel at 3 times the wind speed. In basic terms, speed = more speed. Watch and learn! Peter Barrett was born in Madison, attended the UW, and graduated with degrees in Mechanical Engineering and Law. He competed in the Olympics three times, wining a Silver medal in the Finns and a Gold in the Flying Dutchman. Professionally, he worked for North Sails and later taught financing and accounting at UW-Whitewater.